Get answers to your many questions about who the Amish people really are by taking a rare look into their private world. Few facts of their religion, traditions and culture are known to the outside world, and that’s exactly the way they want it. What do they believe about God? Are the Amish holier than most people? Do they deal with many of the same concerns that plague the rest of the world? Why do they insist on the old fashion lifestyle? 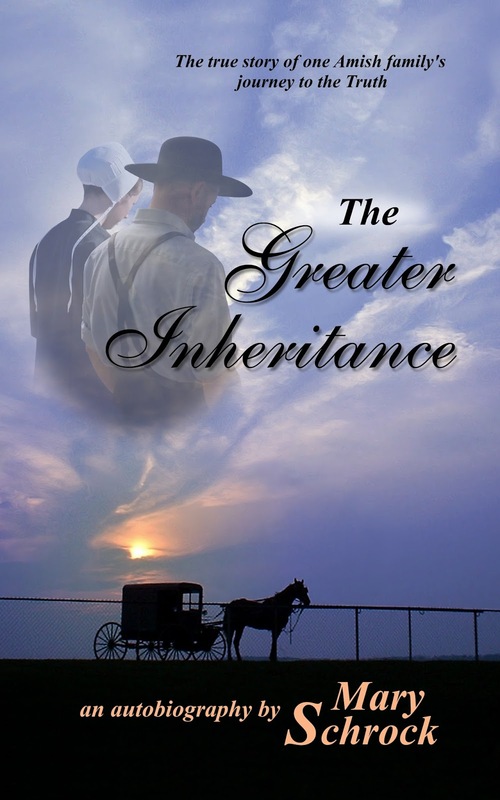 Discover the true facts in this autobiography, THE GREATER INHERITANCE, by a former Amish church member, Mary Schrock. Gain an eye-opening view of the Amish culture, Amish lifestyle and religion as you read this true story of her Amish family's traumatic journey to the Truth. … hundreds of thoughts raced wildly through my mind. Those thoughts soon gave way to tears as I considered all the hearts and family ties that would surely be broken because of our decision to do that which we sincerely believed to be our Lord’s leading. 156 page Paper Back, including many before and after photos! Mary had grown up a devout insider in the cloistered world of the Old Order Amish. Strictly abiding by the rules and regulations of the Amish church, it would not be until the light of God’s truth pierced through to the darkest regions of her soul that she would discover salvation through Christ alone. Unable to remain in a religion that denied salvation by grace alone, Mary and her husband would pursue their newfound freedom in Christ. Rejected by those they loved most, and cut off from all earthly inheritance, would they continue to trust the One who promised to never leave them, nor forsake them? In the end, could they rejoice in a much greater inheritance?